Webrixs is a trusted partner of Bpm’online. We are responsible for both the implementation and the integration of Bpm’online Service for your business. Together we determine which features are indispensable for your customer service and how we can get the most out of this innovative software. Do you have specific additional wishes? Webrixs builds custom solutions, so you can provide the best services with the best tools! Find each contact moment in the fully integrated communication panel. All phone calls, emails and activities are registered and linked to the right account. Provide your customer service with the right information in one single overview to help customers in the best way possible. All relevant customer data, such as Call history and email traffic, is available in one portal. 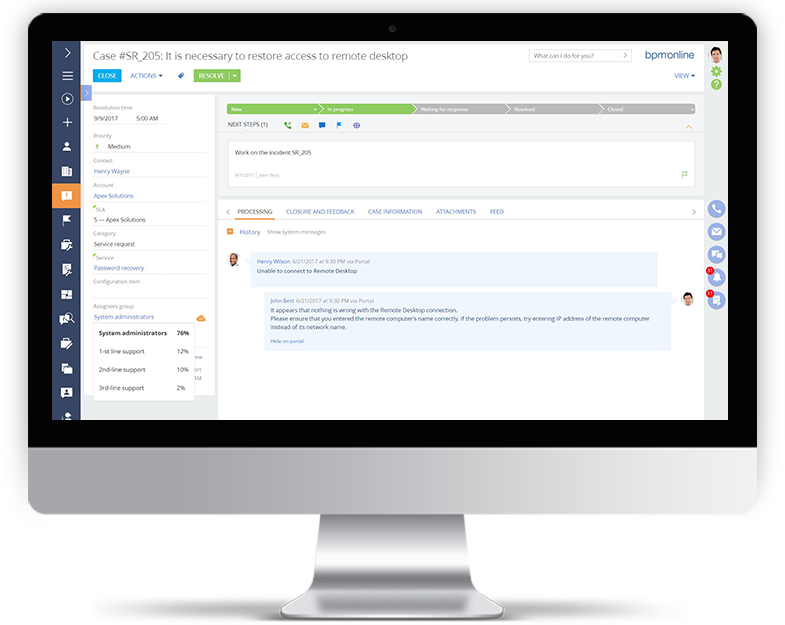 Offer customers the opportunity to submit a direct request and to have real-time insight into their service request. Every application and incident is recorded and is easy to monitor. With a single click, all customer information appears on the screen, including phone and email historie, service contracts (SLA), order history, pending incidents, or requests that are still in progress. Track all customer interaction to easily see how many cases are open, what the average lead time of a case is, and thus continually improve your service delivery. Make it easier for you service desk by logging all services in a services catalog. Services can be directly linked to new customers or existing service contracts. When Customers contact customer service, they only want one thing: to be helped quickly and well. Automating service processes makes it easy for employees to find all the information they need. Think of: FAQ, similar cases, standard support, account details, internal contacts, purchase history and contract information. The Secret of a sustainable customer relationship is customer satisfaction. Your customer service has a big impact on this! Customer satisfaction is particularly determined by the customer experience before, during and after the purchase. With all the necessary information in one central place, you help your employees to offer the best service to your customers. Do you want your customer service to be able to really deal with your customers? Bpm’online Services automates all basic processes and gives your employees all the information they need to provide your customers with the best experience. Curious to what Bpm’online Services can do for your customer satisfaction? Webrixs will be happy to show you!